The use of passive biocathodes could potentially hold the key to producing an environmentally sustainable approach for achieving combined waste water treatment and water desalinization, researchers at Mississippi State University have indicated. Current world population now exceeds 7 billion. As this number continues to grow, so does the demand for fresh water resources. Ensuring access to clean water supplies is now a major priority across the planet. A key factor governing this is the approach taken to achieve effective wastewater treatment and water desalination. Wastewater treatment is commonly achieved through activated sludge treatment utilising biochemical reaction and physical separation, while desalination can be achieved through thermal evaporation or membrane separation. However, both of these approaches are intensive in terms of cost and energy usage and also emit CO2. There is a need to develop methods where external energy consumption is minimized and energy recovery can be optimized. Microbial desalination cells (MDCs) are a recent technological innovation where simultaneous wastewater treatment and desalination are achieved. In such bioelectrochemical cells, chemical catholytes such as ferricyanide are commonly used. However, these are not suitable for large-scale usage due to the prohibitive cost, large energy demands and environmental toxicity issues. Another option is to use air-cathodes, which utilize oxygen as a thermal electron acceptor. However, these can suffer from slower redox kinetics, requiring the use of expensive catalysts, and large energy requirements to maintain aeration levels. A more sustainable and financially viable approach could therefore be to use biological cathodes, which utilise microorganisms as biocatalysts. 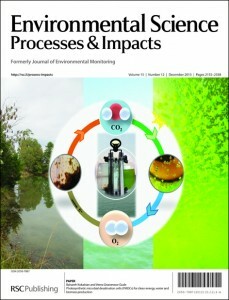 In this study by Bahareh Kokabian and Veera Gnaneswar Gude, which featured as the cover article for Issue 12, Vol 15 of Environmental Science: Processes & Impacts, the performance of an MDC with a conventional air-cathode and a photosynthetic microbial desalination cell (PMDC) utilising the microalgae Chlorella vulgaris were evaluated for their performance in terms of COD removal, desalination and energy generation from sewage sludge. This represents the first study of its kind to be attempted. The results indicate that PMDCs can perform better than air-cathodes and as well as other conventional MDCs. COD removal of 66% and 57% were measured for the PMDC and air-cathode MDC respectively. Desalination rates were also enhanced, with levels of 40% measured for the PMDC and 24% for the air-cathode MDC. Maximum voltage produced was higher for the PMDC (0.236 V) than for the air-cathode MDC (0.219 V). Moreover, the PMDC produces longer, more stable voltage, unlike conventional cathodes where potential reduction occurs after a time. Furthermore, it was shown that only 55% of the cathode volume was utilised, indicating that power production and desalination rates could be further improved if the MDC reactor design and electrode/material configuration are optimized. Algae biocathodes in PMDCs provide the advantage of a continuous supply of electron acceptors and omit the need for additional chemical transport, storage, dosing, and post-treatment. The biochemical nature of the process also means the wastewater is essentially treated as a growth medium, producing valuable algal biomass, which could be used to obtain constructive products such as biogas, biohydrogen and biofuels. This study therefore demonstrates that the use of PMDCs can provide an environmentally benign approach to wastewater treatment in which algae act as an in situ generator of oxygen. This has the potential to be beneficial in enhancing environmental and economic sustainability of water treatment whilst helping to improve COD removal, desalination and energy recovery in the same process. Novel spectroscopic techniques could provide a useful tool for monitoring the physiological status of vegetation in post-mining sites, according to a new study by Zuzana et al from the Charles University in Prague, which featured as our Cover Article in Issue 11. Long-term lignite mining has caused widespread ecological damage in many areas across the world. The principal cause of these problems is acid mine drainage, which causes increased acidity of soil and water environments and subsequent mobilization of heavy metals e.g. Cd, Zn, Co, Cu and Ni leading to plant uptake from contaminated soils. Reforestation is a common method for reclamation of post-mining sites with Scots pine being a popular option due to its high ecological tolerance to diverse environments. Monitoring the effects of low pH conditions and heavy metal contamination and identifying key non-specific indicators of stress in this vegetation is therefore important in order to best develop the most effective remediation strategies for post-mining locations. However, only a limited amount of work has so far been performed under field conditions to establish the effects of high acidity and heavy metal levels on the biochemical processes within vegetation and suitable biomarkers for these effects have not yet been identified. In this study, Zuzana et al. 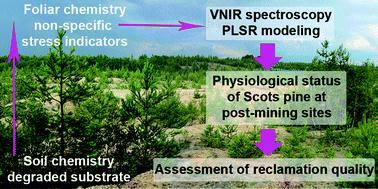 outline the results of a pilot study for monitoring reclaimed post-mining sites, developing a method to identify the key physiological stress factors in Scots pine trees. Spectroscopic methods are becoming increasingly popular in environmental monitoring. They potentially offer a cheaper and faster alternative to conventional biochemical analysis. The approach in this study modelled the relationship between the visible to-near-infrared (VNIR) spectral properties of Scots pine needles and their key physiochemical properties, measured in the laboratory. The most suitable biochemical traits identified as non-specific stress indicators for Scots pine trees were ; relative water content (fraction of weight decrease after drying), content of photosynthetic pigments (chlorophyll a+b and carotenoids, and the ratio of these two components) and concentration soluble phenolic compounds. The technique was applied to four sites in northwest Czech Republic, each exhibiting different levels of physiological stress. The method was able to successfully separate the different sites, using at least three of the above variables, based on their spectral reflectance data and validated using bootstrapped partial least squares regression (PLSR) modelling predictions. 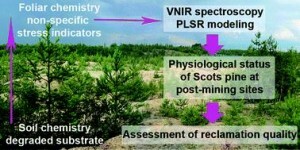 The study demonstrates the potential use for the VNIR spectroscopic technique for estimating the physiological status of vegetation in post-mining sites. The method has potential use in larger-scale monitoring studies, allowing simple and quick assessment of reclamation quality in post-mining regions using air-born or satellite hyperspectral data. 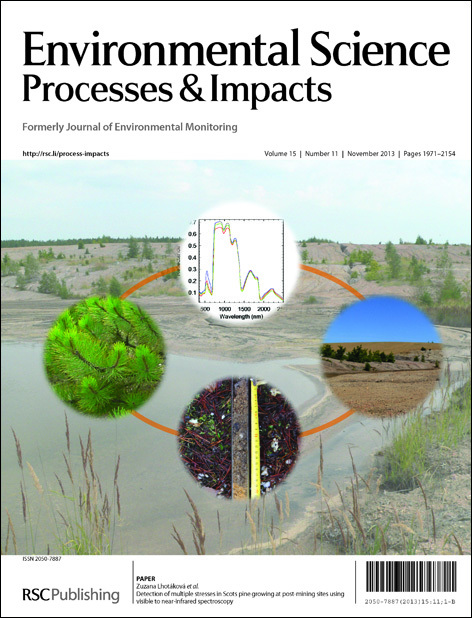 This paper is an Environmental Science: Processes & Impacts HOT article and is of interest to researchers interested in contaminated land remediation, specifically post-mining sites, or anyone that likes trees. Aluminium is the most abundant metal in the Earth’s crust. Its range of desirable chemical and physical properties (e.g. low density, thermal conductivity, corrosion resistance etc) has made it the most widely used metal of the 21st century, utilised in a huge variety of products and applications, from kitchen utensils to aircraft parts, from food packaging to window frames. However, while the extracting and casting of this abundant resource yields many benefits, the disruption of natural geochemical and biochemical systems may expose organisms including humans to potential harm. It is of paramount importance that we fully understand the ways in which humans are exposed to aluminium and its behaviour within the body. This will allow the nature and extent of potential toxic effects to be assessed and enable people to live safely with these possible dangers. 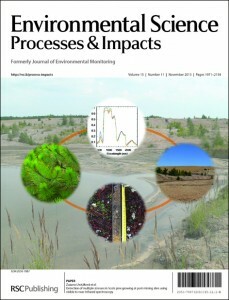 In this article, which featured on the cover of Environmental Science: Processes & Impacts Issue 10, Christopher Exley provides a detailed and comprehensive critical review, addressing these issues. A broad range of specific aspects within the field of aluminium exposure are covered. 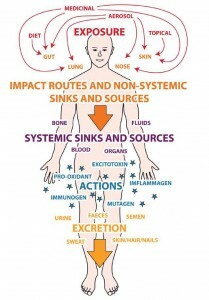 The myriad ways in which humans are exposed to aluminium (including inhalation, diet and cosmetics) are discussed as well as the key impact routes (e.g. skin. nose, lung and gut), distribution networks within the body (e.g. 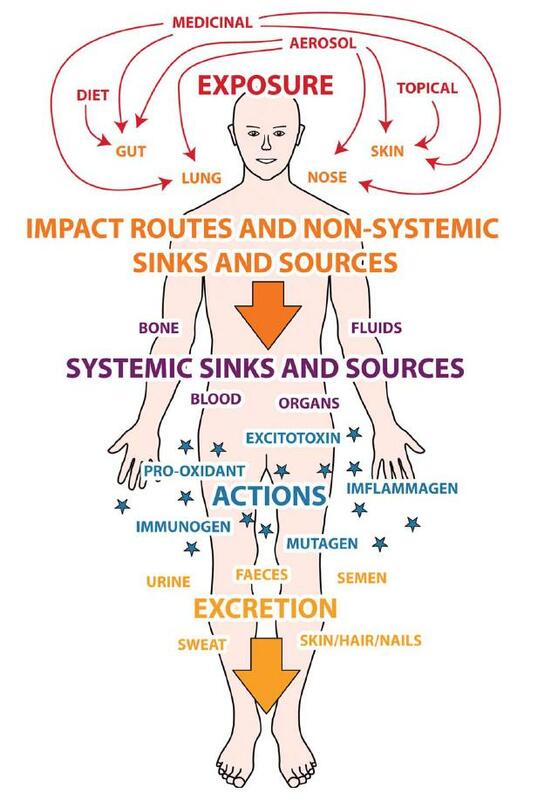 blood) and excretion routes. The mechanisms through which aluminium can exert biochemical effects in humans (e.g. pro-oxidant activity, immunopotency and mutagenicity) are also described. Additionally, the article provides a complete and clear description of the aluminium ‘body burden’ (the balance between exposure and excretion). This article challenges the current perception that aluminium is completely ‘safe’ and demonstrates the need to change our thinking regarding human exposure to metals like aluminium. Furthermore, several key knowledge gaps in this field are identified. Specific areas for future research, required to improve our understanding of aluminium exposure and toxicology, are outlined. In particular, the need to identify specific ‘targets’ within biological systems that may be more vulnerable to aluminium ‘attack’ than others is emphasised. Also, a need to establish an acceptable level of ‘safe’ exposure in humans is highlighted. 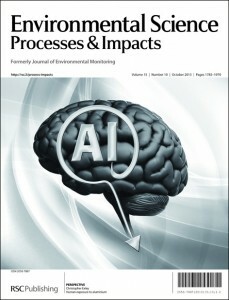 Exley suggests that gaining a full understanding of aluminium exposure and body burden in humans will require further data to be gathered from both laboratory and computer modelling approaches. This article will therefore be a valuable resource for researchers within these fields as well as for policy-makers at local and national levels. A HOT article from a team at the US Naval Research Laboratory is featured on this month’s eye-catching outside front cover, which was recently featured on the Environmental Science: Processes & Impacts blog. In this work, CO2 radiocarbon analysis is demonstrated as a tool to review remediation efficiency by differentiating between CO2 produced by degrading fuel contaminant and that produced naturally by organic matter. Free to access for 6 weeks*! Issue 5 contains two Perspective articles. The first written by Darrah Sleeth at University of Utah, USA, assesses the current air sampling techniques available for sampling beryllium particulates and outlines the components of the ideal aerosol sampler. The second Perspective from Richard Brown et al. at the National Physical Laboratory, UK, follows on from their excellent HOT article featured on the front cover of Issue 3 in February. This Perspective article discusses the consequences of incomplete data coverage and evaluates strategies for making up for such data loss. The authors’ aim is to provoke debate about the best ways to address this problem, so have a read and let us know what you think by commenting below. Discover the full contents of Issue 5 here! Follow Environmental Science: Processes & Impacts on Twitter! The beautiful image on the outside front cover highlights important research from Beat Müller et al. This research conducted in Switzerland combines convenient technologies to develop a method for speedy, portable sediment porewater sampling and on-site analysis. This article was featured on the blog last week and you can browse the blog or read the post here. As a cover article, it’s also now free to access for 6 weeks*! An interesting Frontier review from Xiao-Min Ren and Environmental Science: Processes & Impacts Editorial Board member Liang-Hong Guo on the likely impact of PBDE toxicity on the body, specifically looking at what is known about the molecular mechanism of PBDE in disruption of hormone receptor pathways and how PBDE toxicity is being investigated. Curious to know more about Environmental Science: Processes & Impacts? 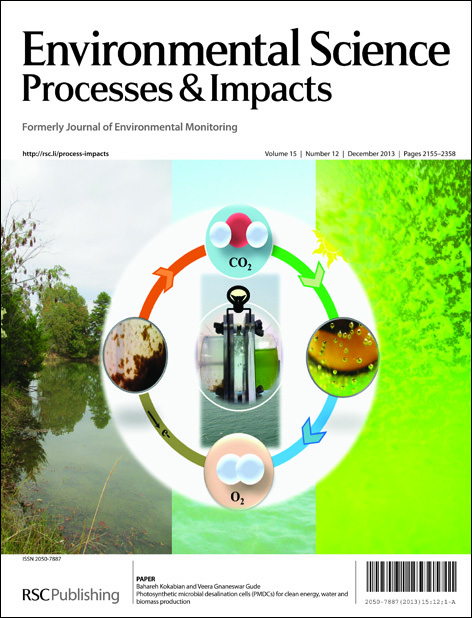 A team at The University of Texas at Austin, USA, present the results of a long-term study of polycyclic aromatic hydrocarbon monitoring at a site of contaminated sediment capping by the Anacostia River in Washington DC in this HOT paper, which was featured on the cover of Issue 3. Capping sediments with clean material to create a barrier between benthic organisms and contamination is a technique to reduce contamination of sediments in situ. PAHs still present an environmental risk long after the source has been eliminated and capping with sand can act as a diffusive barrier giving a clean environment for benthic organisms. Often now materials that actively absorb the contaminants are used, but they usually need a sand layer for benthos organisms to survive. The capping took place in 2004 with four different materials – AquaBlokTM (clay-like material with permeability control), coke in a Reactive Core MatTM (to assess low density material in a thin mat), apatite (for heavy metal sequestration) and sand for comparison. The indicator used to assess chemical migration through these materials was monitoring of pore water concentration profiles. Solid-phase concentration could not be used to compare them due to the limited sorption capacity of sand. They concluded that there were significant concentrations throughout the caps and that the rates of migration in the caps were as expected for the transport characteristics at the site and sorption effect of the materials slowing migration. The caps reached steady state after a few years due to surface re-contamination, however the actual contaminant concentrations were lower than uncapped areas. Tidal dispersion was the primary mixing mechanism in the caps. The team also evaluated bioaccumulation and the ability of pore-water profiling to predict the observed values. Predictions based on pore water concentrations were more accurate than those based on a solid-phase approach. Overcoming environmental data loss, occupational health, active capping materials and more in Environmental Science: Processes & Impacts Issue 3, online now! This was also featured in this week’s blog posts, find the post here! Work from Danny Reible et al. at the University of Texas at Austin, USA is highlighted on the inside front cover. This HOT cover article presents an analysis of a long term study monitoring polycyclic aromatic hydrocarbons migration through capping materials at the Anacostia Rive, Washington DC, USA. They use an innovative passive sampling method with PDMS and assess bioavailability of PAHs using pore water profiles. To learn more about the latest Environmental Science: Processes & Impacts research, view the full issue here! Persistent pollutants in the home, macropore flow and bioavailability in Environmental Science: Processes & Impacts Issue 2 online now! Sohel Saikat et al. from the Health Protection Agency, London, have written an insightful critical review for Issue 2 of what we know about how perfluorooctane sulphonate impacts on human health as it persists in the environment via various exposure pathways. Read the recent blog article for c2em30831b here! Read the recent blog article for c2em30586k here! On the outside front cover, this month’s issue features work from Kalliat Valsaraj and co-workers. In their article, the team investigate the processing of atmospheric polycyclic aromatic hydrocarbons (PAHs) during fog events. The authors identified two processing pathways: (i) the dissolution of OPAC from particulate matter and (ii) the uptake and oxidation of PAH in the fog water droplets. Also in this issue is our monthly Environmental Digest -covering legislation, environmental quality, chemical hazards, public and occupational health and research activities from Europe and around the world, it’s an invaluable source of environmental information. Read the rest of the issue here. The latest issue of JEM is now online, featuring two HOT articles on the cover from Knut Breivik and Matthew Nonnenmann et al. Also, don’t forget to take a look at the latest environmental digest, which this month discusses noise pollution, the disappointments at Rio+20 and more! You are currently browsing the archives for the Cover articles category.